Toshiba is announcing a trio of new enterprise SSD models intended for large-scale datacenter deployments. The new CD5, XD5 and HK6-DC respectively use 2.5" U.2, M.2 22110 and 2.5" SATA form factors. The drives use different Toshiba controllers but share an emphasis on read-intensive workloads, with write endurance rated for less than one drive write per day (DWPD). They also lack some of the features of high-end enterprise SSDs, but still include full power loss protection. All three new SSDs use Toshiba's 64-layer BiCS3 3D TLC NAND flash memory. Toshiba considers their datacenter SSDs and enterprise SSDs to be separate product lines, with the latter being more suited to mission-critical servers and including more high-endurance and high-performance options, and sometimes advanced features like redundant dual-port interfaces. The datacenter drives are aimed at uses like cloud computing infrastructure, where the performance or endurance of an individual drive is less of a concern because the workload is spread over hundreds of SSDs per rack. The CD5 is a 2.5" U.2 NVMe SSD with a PCIe 3.1 x4 link. It uses the same controller as Toshiba's high-end CM5 enterprise SSD, but lacks features like Controller Memory Buffer (CMB) and SR-IOV virtualization support. The smallest 960GB (1TB raw) model uses Toshiba's 256Gb 64L 3D TLC parts, while the 2-8TB (raw) capacity models use the larger 512Gb dies. As expected for this product segment, write performance is far lower than read performance, especially for random I/O. The CD5 idles at 6W and can be configured for maximum power limits from 9W to 14W. The XD5 is M.2 22110 NVMe SSD, with the extra length relative to 80mm client M.2 SSDs allowing Toshiba to include up to 4TB of storage plus power loss protection capacitors. The naming of the XD5 resembles the XG5 client SSD, but Toshiba says they are using different controllers. The XD5's controller is an older design than that used in the CD5 and CM5, and the XD5 only implements version 1.2.1 of the NVMe specification with none of the new features from the 1.3 spec. The next generation XG6 will be using a new controller, but probably won't arrive until 2019. This week at the Open Compute Project (OCP) Summit in San Jose, Toshiba will be showing off a Facebook Lightning JBOF equipped with 30 XD5 SSDs. Toshiba's new SATA SSD is the HK6-DC. As with the XD5, the HK6-DC's name bears resemblance to Toshiba's client SATA SSDs, but the controllers are officially different parts. It appears that Toshiba is skipping the HK5 generation in order to synchronize the enterprise/datacenter SATA drives with the client SATA drives that are up to HG6. Toshiba didn't share sequential or random write throughput numbers, but the write latency ratings aren't too bad for a TLC drive with no SLC write cache. Toshiba will be introducing another SATA SSD in their enterprise product line later this year which will probably include higher endurance and write performance, but they're unlikely to bother with an endurance rating beyond 3 DWPD in the SATA market. 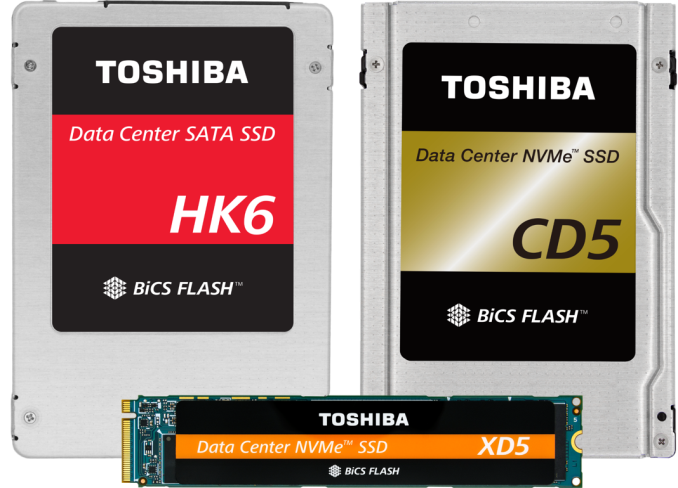 Late this year or in early 2019 the XD5 and HK6-DC may get a mid-generation refresh to use Toshiba's 512Gb 3D TLC parts, but for now the 256Gb parts offer a better balance of performance against cost. The CD5, XD5 and HK6-DC will begin sampling to select customers in Q2 2018.